I saw this picture and I thought it was really fun. This is how deductive reasoning works and in particular syllogistic reasoning. I find this topic really fascinating because when we think about it at first we might think it always works or at least most of the time. 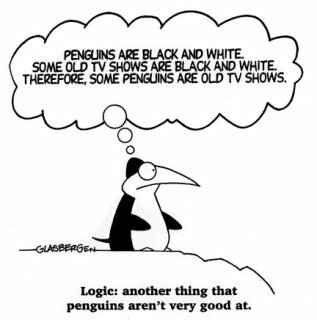 In this case even though both premises are true- penguins are black and white as well as old TV shows- we immediately realize that they not always lead to valid conclusions. lol this is cute 🙂 its such a great example that deductive reasoning does not always lead to a “correct” answer – there is so much more to reasoning!